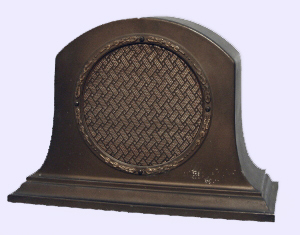 RCA 100-A Model Radio Loudspeaker, made in USA, serial # 966976 BW, bronze finish, cast pot metal. Body in mantle clock design. Circular speaker grill has woven design of gold and black thread with a raised metallic decorative border with gold highlighted design. Piece has same grill on both front and back. Speaker grill diameter is 6 3/4 inches. Has original cable with two prong plug. Height is 10 3/4 in. (27.3 cm. ), 15 1/8 in. (38.4 cm.) width, and 7 1/2 in. (19 cm.) deep. Small 2 1/5 inch tear in grill cloth on the back side of unit. Generally Very Good Condition.